"When the world and the enemy come calling at the hearts' door of our children, it is the heart string connections created by the culture of family worship that will keep them walking by faith in God's Word, rather than bending to the world." Family worship time is the heart of our family's teaching in biblical character. We want our children to grow to worship God in spirit and in truth. Family worship is where we cultivate the daily biblical values we are teaching to our children. The morning, afternoons and evenings that we spend in worship as a family are the heartbeat of this family's life as disciples. The art of family worship can help create the centrally-focused and essential culture needed in the Christian home. When the world and the enemy come calling at the hearts' door of our children, it is the heart string connections created by the culture of family worship that will keep them walking by faith in God's Word, rather than bending to the world. Everyone has their own place and responsibilities in our family worship time according to their skills, abilities, talents and giftings. Each member of our family is essential to contributing their own part in family worship time. The moments spent in worship as a family help our children to feel a part of something larger than themselves and help to continue to establish a beautiful since of community and communion as in Christ's holy church. Scripture reading and discussion is typically assigned by Daddy or the Scout, as they will be leading our devotional study during worship, or prompting the rest of the family with questions. Everyone participates in the reading of God's word and in the discussion regarding our observations and real-life applications. Singing Songs & Hymns: Both the girls and myself have our own set of items to bring to the Family Worship table. The Squeaker and the Bug will usually help me select hymns from our family hymnal or songbook. We have them prepared in advance, as my husband likes to switch up the order, quite frequently to keep us flowing. The Bug also likes to usually bring the Scripture Memory Box to share scripture memory with the family. 1. CIRCLE TIME: We gather in the mornings for Circle Time. Circle Time takes place before breakfast and it helps set the tone and order for our entire day. Each child has a place in sharing during Circle Time, and they take turns with some of our Circle Time activities. Circle Time will begin with prayer, then we move to our Scripture Memory Box. Next, the Scout will lead us in a short devotional. Right now, he is reading to us daily from "Jesus Calling" and we have really enjoyed using this resource. In the past, and occasionally still, we use the daily online devotionals from Kids 4 Truth. 2. SUPPER TIME: We gather each evening at the family table. This is a great place for us to commune together and share our lives. It is also a spring board place for us as parents to start discussion over coming family devotion topics, issues that we see the kids struggling with, current issues in the world and the biblical worldview, etc. It is a family tradition that my kids will remember, and I cannot speak enough on the importance of taking this time with your children now, while they still want your time. 3. EVENING FAMILY DEVOTION: We have a set time to enjoy evening family devotionals, twice a week. The gentlemen will usually prepare a devotional message or topic for discussion and the ladies will help with music and prayer. It is just another reason to slow down, be thankful and give praise to a most worthy God! We are made and built for the purpose of giving worship to GOD and serving Him alone! That is the entire meaning of our existence. We want our children to embrace their purpose and learn the benefits of doing so at home. God is seeking those to worship Him in spirit and in truth. Our prayer is that our family will give this kind worship daily . . . preparing ourselves for a crown of glory in heaven, to lay at the feet of Yeshua (Jesus) the King! How do you promote family worship in your home? 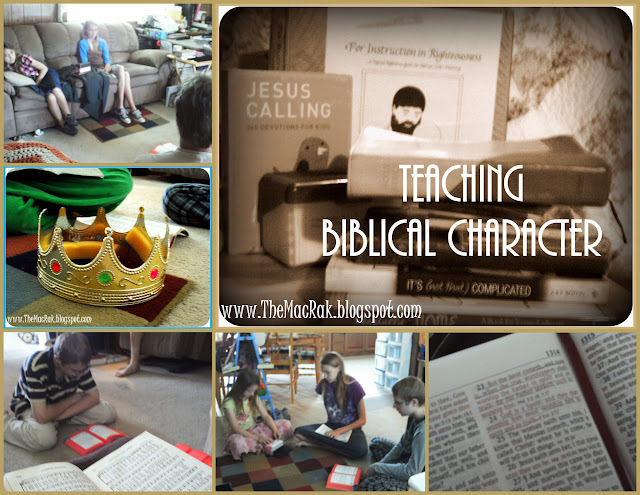 Be sure to join us again tomorrow for the next installation in our Teaching Biblical Character as we take a peak at Personal Devotion. MOM ONLY! Boot Camp - Best little Homeschool Conference. Having a Generational Heart in your homeschool. Join Smockity Frocks and Joyful Socks Mom for a day of fellowship and fun for home educating moms! Vision Forum - Discipleship and Education for Christian Families. SHAPE Academy - SHAPE offers excellence in home education: affordable, original and fun! Statement of Disclosure: This post contains affiliate links. The blog owner receives a small, TINY, portion of sales generated from these links. This blog writer does not receive compensation for thoughts or opinions expressed on this blog. Thank you for your kind consideration.